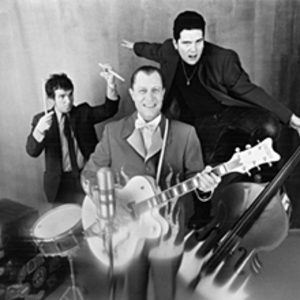 The Reverend Horton Heat is both an American three-piece psychobilly band from Dallas, Texas, and the stage name of its singer/songwriter, Jim Heath (born in 1959 in Corpus Christi, Texas). The group originally formed in 1985, playing its first gigs in Dallas's Deep Ellum neighborhood. Its current members are Jim "Reverend Horton" Heath on guitar and lead vocals, Jimbo Wallace on the upright bass, and Scott Churilla on drums. Through relentless touring and a manic stage show, they have established themselves as one of the most popular underground acts in America. The group originally formed in 1985, playing its first gigs in Dallas's Deep Ellum neighborhood. Its current members are Jim "Reverend Horton" Heath on guitar and lead vocals, Jimbo Wallace on the upright bass, and Scott Churilla on drums. Through relentless touring and a manic stage show, they have established themselves as one of the most popular underground acts in America. Their sound is self described as "Country-fed punkabilly." Their music is a mixture of country, punk, big band, swing, and rockabilly, all played loud and energetically with lyrics that are often very humorous. Jim Heath played in a cover band called Southern Comfort with friends from Corpus Christi Ray, his high school, before attending the University of Texas at Austin in the fall of 1977. At UT, he often entertained friends and dormmates and was often found playing in the stairwells at Moore-Hill Dormitory late into the night to avoid disturbing the sleep of roommate Harold Shockley, now a Corpus Christi banker. Jim left school in the spring to join up with a touring cover band by the name of Sweetbriar. Three years later, former dormmate David Livingston, now in his senior year of school and at home visiting family, saw a familiar face on stage and reunited with Jim. David told Jim stories of the punk music scene in Austin and the acts playing at venues like Raul's and Club Foot. Once, while home on another visit, David took Jim to a Dallas rock and roll venue, The Bijou, to see an act called The Cramps. After the show, there broke out a punks vs. rockers brawl in the parking lot. While Jim and David escaped any involvement in the scuffle, Jim later claimed to have had an epiphany on that evening. Always a fan of blues and honky tonk, Jim returned the favor by taking David and his wife, Ellen, to see The Blasters in Dallas at a venue known as the Hot Klub and Jim's love for roots rock took over from there. Jim had married a former bandmate from Sweetbriar, and together they had a child. Together they decided that the rock-and-roll lifestyle was over and that it was time to have real jobs. Around 1985, Jim was known as "Jim the Sound Guy" by those who frequented two warehouses that by night became music venues, Theater Gallery and The Prophet Bar. Jim used the old Sweetbriar PA system to earn from $20-$50 per night for extra money, running sound for bands such as the New Bohemians, End Over End, Shallow Reign and Three On A Hill. One night during a lull, Russell Hobbs, one of the original Deep Ellum visionaries and proprietors of these venues goaded Jim into getting up to play. He played alone, tearing through a version of "Folsom Prison Blues" that is now so familiar to millions of Reverend Horton Heat fans around the world. Throughout the song, Hobbs hooted and shouted out, "Go Reverend". Jim decided then and there to form a band and came up with the name Reverend Horton Heat, as an ode to Johnny Horton, using the shortened version of his last name, Heath. The late nights and the fact the Jim was now playing in a band and his wife and former bandmate was not took its toll on the marriage and she soon left with their child and dog. Jim's feelings upon the loss of his family are well documented in the song, "Where In The Hell Did You go With My Toothbrush?". The Jimi Hendrix poster mentioned in the song was on the back of a door that Jim used for a practice room in the house he shared with his wife and child. The dog's name really was Smokey. About this time, David and Ellen moved back from Oklahoma City, where they had been since graduating from UT. David began to book gigs for Jim and his new band, and their refeshing sound and raw live performance quickly won over the local music scene. Jim drew crowds to brand new music venues, playing three nights a week at Froggy Bottoms in the then brand new West End and assured a quick start to Club Dada, the first "for profit" bar in Deep Ellum by playing every night for the first two weeks that it was open. David continued to work with Reverend Horton Heat until 1989, when his own new family and day job required all of his attention, and Jim needed a real manager who could get him out on the road and into the studio. Jim and David remain close friends today, and a song that they co-wrote together back in the '80s, "Liquor, Beer and Wine", appeared on 1994's "Liquor In The Front".